Over three days in August of last year, a cluster of young musicians holed themselves up in the Fish Factory recording studio in north-west London to capture the sound of the capital’s thriving jazz scene. The session was instigated by Gilles Peterson, the progressive DJ and tastemaker, who's set to release the nine tunes as the We Out Here compilation via his own Brownswood Recordings label on February 9. The saxophonist and clarinet player (and recent Impulse! 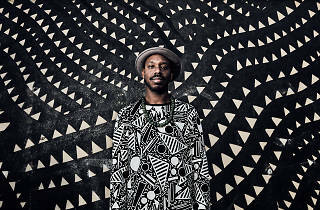 Records–signee) Shabaka Hutchings was entrusted to act as the project's musical director. "There's such a strong scene at the moment and we felt it was a situation where if it's not documented properly it can be easily forgotten," Hutchings says from his base in London. The We Out Here movement is an inclusive one. As Hutchings explains, "It's not a bunch of artists saying this is our vision and we're going to force it onto the public—it’s something that's developed alongside groups of young people who want to hear the music.” Gigging and recording in a London where half of the city's live music venues have shuttered since 2007 prompted the We Out Here players to etch out their own community and in turn reach a new audience. Experiencing the scene doesn’t demand paying high ticket prices to enter fusty spots with two drink minimums—it’s about getting hip to the DIY venues, warehouse spaces and dance parties that have popped up around the city. At one point, workshop and gig spot Total Refreshment Centre asked patrons to enter the venue via a gas station. “We’ve found a way for young people to hear jazz music for not a lot of money,” says Hutchings. True to this spirit of inclusiveness, the artists have organically developed diverse musical relationships and friendships, in part hooked around a willingness to take a jazz foundation and layer on references to hip-hop, Afro-beat and British rave culture. The interconnectedness running through We Out Here reinforces the point: The sax player Nubya Garcia, who has worked with jungle producer Congo Natty, calls on Femi Koleoso and Joe Armon-Jones from the Ezra Collective to lay down drums and keys at her live shows; on Maisha’s "Inside The Acorn" Garcia guests with Hutchings to create a spiritual improvised soundtrack for the movement. One of Hutchings's own bands, Sons of Kemet, also counts the big energy tuba playing of Theon Cross as a vital part of its membership, and in turn Cross contributes the raucous jazz banger “Brockley” to the compilation. Further bonding the We Out Here musicians is the shadow of a Britain beset by Brexit and a world where identity politics are a part of daily conversations. The playing across the album has a bucolic and melodic sheen, but there's a tangible defiance and even anger that powers many of the lead sax, horn and keys lines. Hutchings says this isn't meant to be an overt political statement, but an abstract nod to "the link between the political space we're in and the music we make." Invoking We Out Here’s illustrated cover, which depicts a precocious fox strutting through a dusky cityscape, he plots the musicians’ place in the world another way: "It's a wild animal in an urban environment and in some ways it's out of place, but the fact you see foxes all the time in London means it's found a role for itself—but it's never been domesticated." Gilles Peterson hosts British Jazz Showcase with The Comet Is Coming + Nubya Garcia + Yazz Ahmed + Oscar Jerome play Le Poisson Rouge Wednesday, January 10 at 7pm. $20. Sons of Kemet (Shabaka Hutchings, Theon Cross, Tom Skinner and Eddie Hick) plays Winter Jazzfest Marathon on Friday, January 12 at 7:40pm. For ticket info, visit winterjazzfest.com. 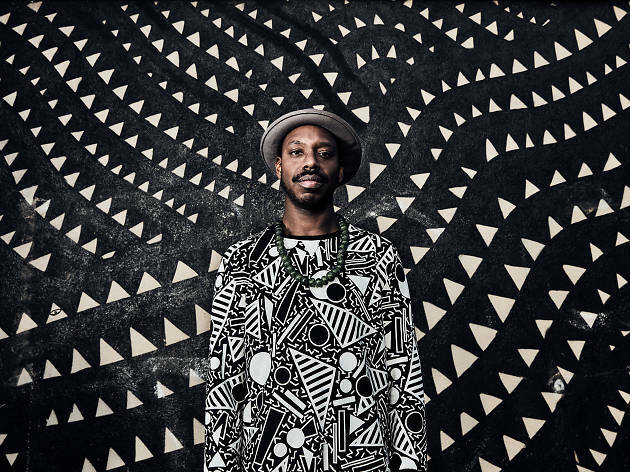 Shabaka Hutchings, "Black Skins, Black Masks"
This seven minute groove-based exploration nods to '60s jazz and Afro-beat. Mansur Brown's unabashedly big guitar solos spearhead the track's slick fusion vibes. Sink into this nostalgic, congo-infused lament penned by composer and guitarist Oscar Jerome. Theon Cross’s deep tuba playing underscore the swaggering sax solos. Afrobeat–style brass fanfares propel this quintet’s upbeat, cosmic vibes.